For over 30 years Fiorelli has been one of the UK’s leading fashion and accessories brands, creating stylish pieces for the modern, urban woman. The iconic label has been attentive to its shop aesthetic, understanding that its retail presence is important to the broadening of its appeal in the UK market. 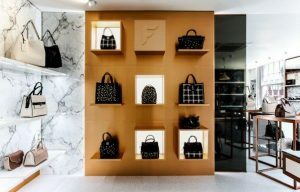 Fiorelli’s most recent collaboration, with designers Beyond Communications, sees the development of its new London showroom as a blueprint for its retail format. 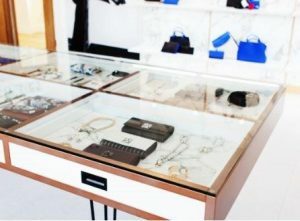 The new shop features hero product displays coupled with marble decor clad merchandising zones and an array of display items to support new product categories. Fiorelli believes that a beautiful handbag does not have to cost hundreds of pounds – even if it looks as though it does. Beyond Communications’ specification of the Calacatta Marble décor from the TrueScale range by Formica Group for the display stands and cabinets, exemplifies this approach. TrueScale marble decors have been designed by Formica Group to accurately capture the imperfections found in real Italian and Brazilian marbles. Calacatta marble design is based on a genuine Italian Calacatta marble slab. It is this attention to detail, which includes a no repeat veining across the full width of the laminate sheet that gives the décor its authenticity, helping to provide an upscale identity to Fiorelli’s retail environment. Real marble is expensive to source, can stain, and has a density that makes it difficult to work with when compared to TrueScale by Formica Group Calacatta Marble. As a lightweight alternative that is significantly easier to apply to the retail environment, TrueScale’s delivery of an authentic marble décor at a fraction of the price shows that beautiful surfacing too does not have to cost hundreds of pounds – even if it looks as though it does.